Mango, sugar cane, citric acid. The old Indian myths prices the mango as a food of the gods that supposedly donated a mango tree in Buddha Garden, providing a gorgeous refreshing shade. Even today, the fruit applies to the magnificent setting, yellow content almost as Indian national symbol. Mangos can now relate to virtually all tropical and some subtropical countries, however, is and will remain India the original home of this delicious fruit and is therefore also the main exporter. Mangos contain large amounts of vitamin B and C. What is more, the pro-vitamin A, which is particularly important for the skin and visual function. The MANGO CUBE is in every aspect a mighty fruit bomb in cube form, which will meet you with his many extras right in the taste buds. If you feel the desire for fine sandy beaches, gentle summer breeze, and azure waters, the next holiday at the beach is probably still very far off in the distance. With exotic fruit, you can immediate bring a little holiday feeling in your own four walls and kidnap your senses to the beaches of the world. The MANGO CUBE are dried candied mango cubes, the sweet feeling of tropical regions whose exotic flavour catapulted directly into your taste buds. Due to the gentle drying process, the fresh, fruity aroma of mango will wonderfully be preserved and his subtle sweetness of this delicious taste is gently strengthened. A gorgeous tropical snack for any occasion. 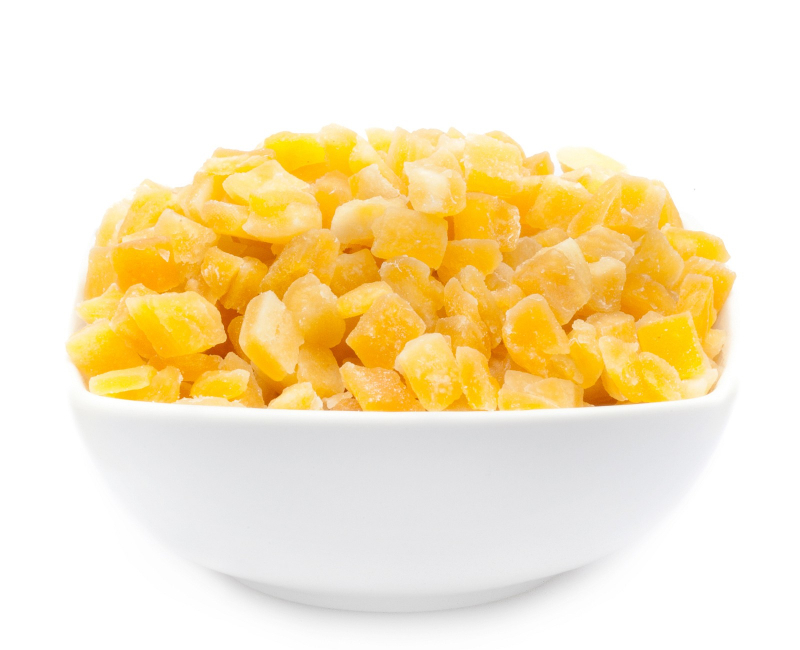 Our delicious MANGO CUBE is small, dried mango cubes, finely crystallized. The ideal companion to dreary rainy days to feel a little sun in the heart and dreaming of tropical islands. Especially delicious taste, the sunny yellow cube in cereals mixture as a fruity opponent to delicious oat and spelled flakes. Mixed with high-quality nuts, the MANGO CUBE becomes a huge tropical snack of healthy fruity nature. Topped by a few kokos aromas, holds guaranteed the sun collection. Pamper yourself some games to exotic species and cross too - you will not regret it for sure!